This incredible Beach collection by Australian designer Amelia Stevens draws influence from the Victorian seaside town of Anglesea and would complement those planning a Beach & Nautical styled ceremony. 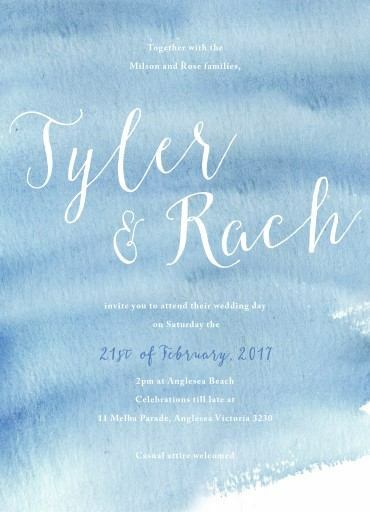 These rustic beach wedding invitations from the broader Beach collection looks amazing when printed using digital and we think it looks best using Paperlust Linen. 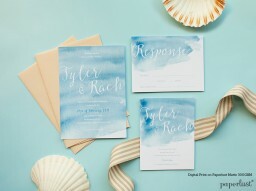 This wedding invitation's colors and design let you know that a memorable event is just around the corner. The way the font is layed out make the card flow seemlessly when conveying all the details of the upcoming celebration between lovers.